We’re thrilled to be the winner of Best Surrey Pub in Surrey Life magazine’s Food & Drink Awards 2018. Voted for by the people of Surrey it recognises not only our stunning location but the excellent food, drink and warm welcome to be found here. The Barley Mow has changed very little through the ages. Real ales are kept in the cellar and are still served by hand pump. Today, the pub continues to provide hospitality for locals and visitors alike, and the many photographs and artifacts on its walls give testimony to its long and interesting history. 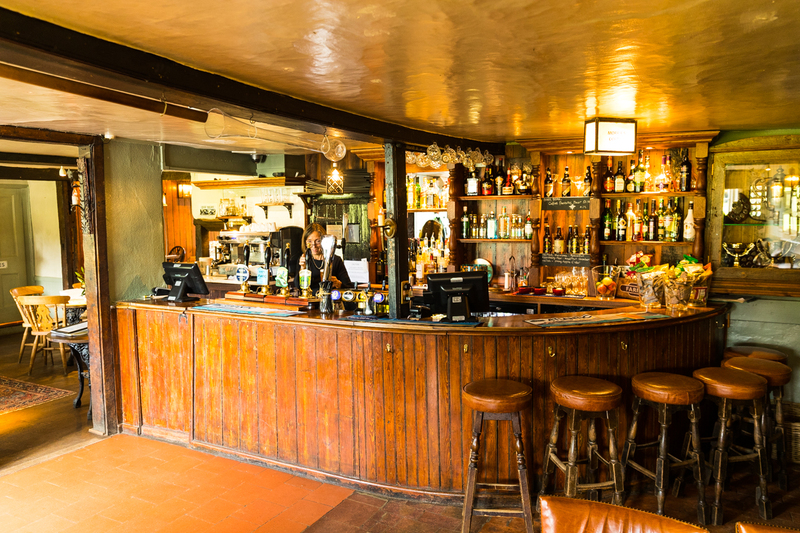 The Barley Mow continues to be run as a busy and well-loved pub – frequented by people from all walks of life, from visitors passing through, to its ‘locals’. Watching the cricket with a pint, leaning on the wall outside in the summer, to the warm glow of the open log fires and a glass of mulled wine in the winter – it remains one of life’s constants. The building that is now The Barley Mow was built in 1705. It was joined to Tilford Green Cottage which dates back to 1601 when Elizabeth I (daughter of Henry VIII) was Tudor Queen of England. The date of which it became an alehouse is presumed to be 1763 as this is inscribed on the chimneystack. In 1821, William Beldham (“Silver Billy”) took over as Landlord. Silver Billy was one of England’s most famous cricketers; his picture hangs in the public bar and the original hangs in the Long Room at Lord’s Cricket Pavilion. He is said to still haunt the pub. Cricket is played every Saturday and Sunday afternoon from April to September and photographs of the Tilford Cricket Club in years past can be seen adorning the walls of the pub, as can the famous l’Anson Cup which was won by the Club three years in succession – in 1908, 1909, and 1910 – to win outright. The Barley Mow is the clubhouse of the Tilford Cricket Club. I was born and grew up in Surrey. I spent the last 30 years on the Isle of Wight where I ran several businesses including my own Bar and Restaurant, Coffee Shop and Tea Rooms. I already had a passion for food and learnt from my husband, a fully trained chef, how to produce amazing dishes and successful menus which we became known for. Coming back to Surrey and running the Barley Mow has been a wonderful extension of my life in the hospitality business and I am very proud of what my team and I have achieved in the last year. That was 5 years ago, and the rest, as they say, is history! Dinner service is headed by Deborah or Kim, with Josh, Grace and Zach pulling your choice of cask ale or serving a bottle of carefully chosen wine from the extensive wine list. Adrienne, Chantal and Hennue serve your lunch time drinks and food orders with a friendly smile and chat. We have three fully trained and qualified chefs in the kitchen. They all bring their own slant to our traditional menu, producing a spectacular contemporary twist to the choice of food for our customers.